Appearance - Pours crystal clear and brilliant golden orange in color with an off-white, finger width head. Good retention before peeling back to a thin, broken layer of suds with a build up around the edges. Fair lacing, with broken webbing and small spots decorating the glass. Smell - Strong citrus aroma hitting on orange, tangerine and a hint of white grapefruit. Underlying crackery malt aroma. Taste - Follows the nose. 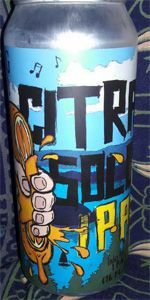 Citrusy flavor that sits somewhere between orange and tangerine with slight dank and grapefruit character. Generic bready malt sweetness. Finish adds a light pithy bitterness. Mouthfeel - On the lighter side of medium bodied with fair, tingly carbonation. Slick, easy drinker with a slightly dry finish. Overall - Good brew, but like most single hop beers it doesn't offer much the way of interesting dynamics.